Roberto Gastone Zeffiro Rossellini was an Italian film director, screenwriter, and producer. Rossellini was one of the directors of the Italian neorealist cinema, contributing to the movement with films such as Rome, Open City (1945), Paisan (1946), Germany, Year Zero (1948), and General Della Rovere (1959). David O. Selznick was an American film producer, screenwriter and film studio executive. He is best known for producing Gone with the Wind (1939) and Rebecca (1940), each earning him an Academy Award for Best Picture. Jennifer Jones, also known as Jennifer Jones Simon, was an American actress and mental health advocate. Over the course of her career that spanned over three decades, she was nominated for the Academy Award five times, including one win for Best Actress, as well as a Golden Globe Award win for Best Actress in a Drama. 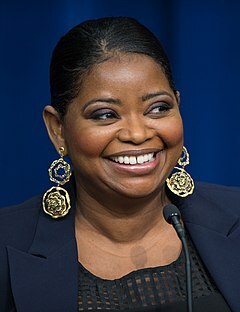 Jones is among the youngest persons to receive an Academy Award, having won on her 25th birthday. Isabella Fiorella Elettra Giovanna Rossellini is an Italian actress, filmmaker, author, philanthropist, and model. 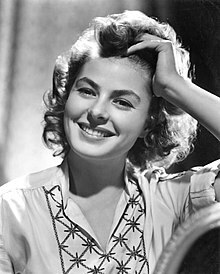 The daughter of Swedish actress Ingrid Bergman and Italian neorealist film director Roberto Rossellini, she is noted for her successful tenure as a Lancôme model, and for her roles in films such as Blue Velvet (1986) and Death Becomes Her (1992). Rossellini also received a Golden Globe Award nomination for her performance in Crime of the Century (1996). Dorothy Hackett McGuire was an American actress. 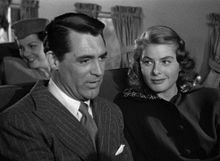 She was nominated for the Academy Award for Best Actress for Gentleman's Agreement (1947) and won the National Board of Review Award for Best Actress for Friendly Persuasion (1956). 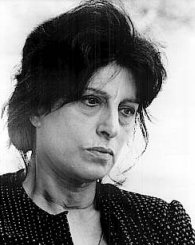 Anna Magnani was an Italian stage and film actress. She won the Academy Award for Best Actress, along with four other international awards, for her portrayal of a Sicilian widow in The Rose Tattoo. 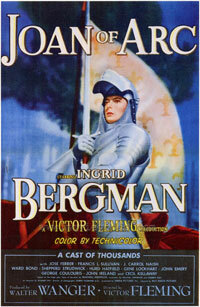 Joan of Arc is a 1948 American hagiographic epic film directed by Victor Fleming, and starring Ingrid Bergman as the French religious icon and war heroine. It was produced by Walter Wanger. It is based on Maxwell Anderson's successful Broadway play Joan of Lorraine, which also starred Bergman, and was adapted for the screen by Anderson himself, in collaboration with Andrew Solt. It is the only film of an Anderson play for which the author himself wrote the film script. 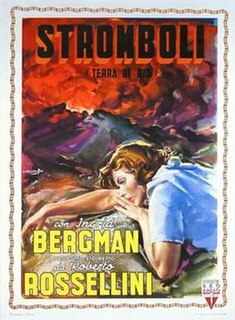 Stromboli, also known as Stromboli, Land of God, is a 1950 Italian-American film directed by Roberto Rossellini and featuring Ingrid Bergman. The drama is considered a classic example of Italian neorealism. Intermezzo (1939) is a romantic film made in the US by Selznick International Pictures and nominated for two Academy Awards. It was directed by Gregory Ratoff and produced by David O. Selznick. It is a remake of the Swedish film Intermezzo (1936) and features multiple orchestrations of the Heinz Provost's piece of the same name, which won a contest associated with the original film's production. The screenplay by George O'Neil was based on the screenplay of the original film by Gösta Stevens and Gustaf Molander. The scoring by Lou Forbes was nominated for an Academy Award, and music credit was given to Robert Russell Bennett, Max Steiner, Heinz Provost, and Christian Sinding. The cinematography by Gregg Toland who replaced Harry Stradling was also nominated for an Academy Award. Gregory Ratoff was a Russian-born American film director, actor and producer. His most famous role as an actor was as producer Max Fabian in All About Eve (1950). A Woman Called Golda is a 1982 American made-for-television film biopic of Israeli Prime Minister Golda Meir. Ingrid Bergman: In Her Own Words is a 2015 Swedish documentary film about Ingrid Bergman directed by Stig Björkman. It was screened in the Cannes Classics section at the 2015 Cannes Film Festival where it received a special mention for L'Œil d'or. Ingrid Bergman was a Swedish actress who appeared in a number of critically acclaimed European and American films and television series. She subsequently received a number of awards, primarily during the 1940s and 1950s, though she did receive some recognition during the 1930s, 1960s, 1970s, and 1980s. She is best remembered for her roles as Isla Lund in Casablanca, and Alicia Huberman in Notorious, but despite the critical success of both films, she was a notable absence from the nominations they received in their subsequent awards seasons.